Lupita Nyong’o is among the stars featured in the 2018 “Actors on Actors” issue of Variety Magazine. 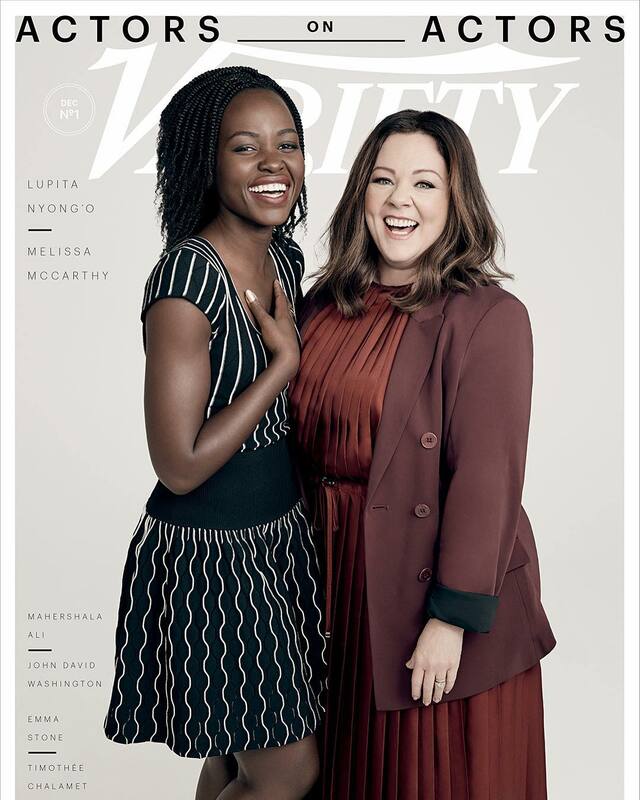 She graces the magazine cover alongside fellow actress and comedienne Mellissa McCarthy. Inside the magazine, the Black Panther star talks about being a woman in Hollywood, handling rejection and all things Black Panther. Shot by Iranian-Texan photographer Shayan Asgharnia, Lupita looked simple and pretty in a black and white below-the-knee dress, styled by Micaela Erlanger. We couldn’t help but notice her hairstyle. Lupita together with her trusted hairstylist Vernon François are known to often play with striking looks and this is no different. The hairstylist took a break from her usual cropped/updo styles and did protective crotchet twists for the cover feature. The hairstyle is a fave for most naturalistsas because of its versatility, (it could be styled up or down), how lightweight it is and it helps with length retention.